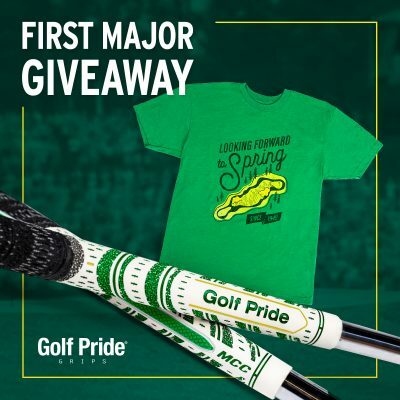 Why is your brand new shiny pitching wedge as long as your old 8-iron? Because it IS an 8-iron. Hot off the presses is the announcement that TaylorMade just came out with a new set of irons. Kind of a bummer really. I hadn’t even taken off the plastic off the set I bought yesterday and now they’re already obsolete, due to these new LONGER ones which came out today. Now the question is, do I buy the new ones from today knowing that tomorrow’s model will be even better and longer? I poke fun, but that’s the sad state of the golf equipment industry. 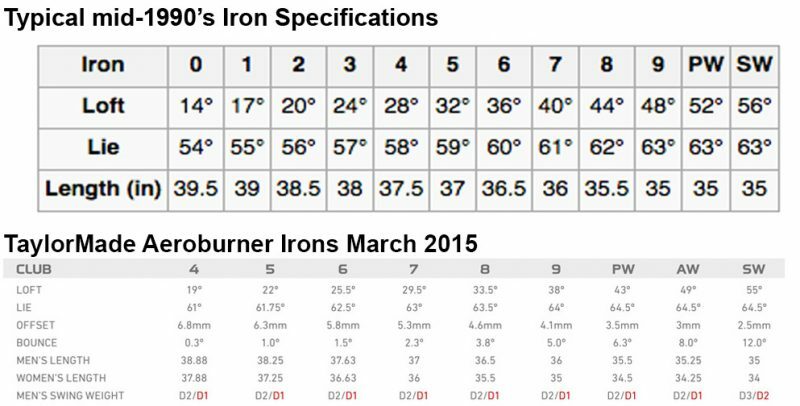 Comparing mid 1990’s iron specs to the new TaylorMade Aeroburner 2015 irons. Golf marketing has completely bastardized the equipment world. Marketers will go to great “lengths” to sell clubs. Most of the manufacturers and their marketing firms are guilty of falling into the trap of promising more and more distance, not just TaylorMade. Marketing will continue this practice so long as the consumer believes he/she will gain more distance. Take a look at the photo above. It compares iron specifications up to the mid 1990’s with the new TaylorMade “Aeroburner” irons. Some golfers seem to be aware that the lofts are getting stronger year after year, but most don’t seem to notice shaft length. In the photo above look at the old pitching wedge as an example. The 1990’s model PW was 52 degrees, and had a 35 inch shaft. The Aeroburner 2015 pitching wedge is 43 degrees! NINE degrees stronger. But that’s not all. Look at the shaft length. The new PW is the same length as what an 8-iron used to be. A good friend of mine was so excited when he bought his RocketBalls irons a while back. “I hit my 7-iron as far as my old 5-iron,” he excitedly told me. Once I explained that his new 7-iron and old 5-iron were the almost the same specs he wasn’t as excited. In fact, he was mad. The new Ben Hogan has started doing this a bit, though I’ve had this concept in my mind for years. Either the numbers representing irons should have a fixed area in the spec table, or the numbers should be removed from the club and replaced with the loft and shaft length. That way when comparing clubs, one could only claim to be longer against other clubs with the same specs. So, the TaylorMade 5-iron above would be called a “22” for 22 degrees in loft. Perhaps add a 38.75 to the name: 22-38.75. The closest club in the 1990’s chart above would be between a 2-3-iron, but the shaft length closer to a 1-iron. As an alternative there should be limits as to what numbers can be put on what clubs should be put in place. In another 5-10 years at the pace we are on, a pitching wedge will be 20 degrees, and we will all be hitting them 200+ yards. Of course, neither of my ideas above will happen. So irons will get stronger and stronger. The distance between a lob wedge, usually a 60 degree club, and a pitching wedge will increase. That’s why the “gap” wedge was invented. The gap wedge filled the growing gap between pitching wedges and sand wedges and gave golf club manufacturers another club to sell. We are going to need another gap wedge. Let’s call it a gap gap wedge. Back on January 3rd, 2006, I reviewed the Eidolon V-Sole wedges. V-Sole wedges were the creation of “The Wedge Guy” Terry Koehler. I loved the V-Sole wedges and they were instant gamers. Fast forward to 2013. Seven years and 100’s of golf clubs later, I STILL have a V-Sole 56 degree in the bag. I’ve gone through dozens of other wedges, irons, fairways, hybrids, drivers and even a few putters (mainly because my putter was stolen). The ONE club which remains in my bag over a seven year period is that Eidolon V-Sole 56. It has been a fantastic 100-110 yard club and is hands down the best wedge I’ve ever played out of the sand. 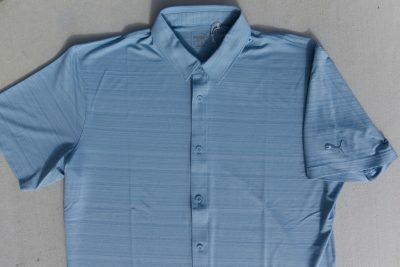 Naturally when I heard from SCOR Golf, a subsidiary of Eidolon Brands, I was thrilled. 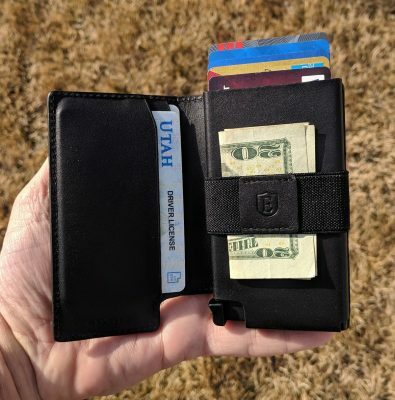 They asked if I’d be willing to check out their golf scoring system, featuring either four or five scoring clubs, all with the V-Sole technology my trusty 56 possessed. Sign me up. The SCOR 4161 is a golf club “system” which replaces most of the short clubs in the golf bag, barring the putter. A custom fitting and analysis is performed by a SCOR tech, or online if you’re not able to do a fitting in person. They analyze your game, your swing, and also your existing irons. Upon completion of the analysis they build you a set of four or five clubs, your choice. Your old irons are only kept up to the 8-iron. From the 9-iron (now known to me as my 42 degree club) on, all are SCOR clubs. SCOR’s “SGC3 Progressive Weighting” distributes the mass of each club related to the loft. The benefits of this weight distribution are consistent trajectories, control, and consistent distance through the set. I really dig the SCOR concept and can’t believe nobody else had come up with it yet. The four or five wedges they create for your set are all perfectly gapped in terms of loft. In the case of my personal set, they’re gapped in four degree increments from the 8-iron. My 8-iron is 38 degrees, therefore the next club is 42 degrees. The next club is another four degrees at 46, then 50, 54, 58. My SCOR set then: 42, 46, 50, 54, 58. What is V-Sole technology? FIrst, one must know what the sole of the club is. The sole is the bottom of the club, the part which bounces off the ground when the club strikes it. The “V” in V-Sole represents the shape of the sole. The V-Sole allows the player to vary the amount of bounce the club has based on how open or closed the club is. This technology, as I mentioned, is especially good in sand. If you look closely at the face of the SCOR wedges, you’ll see a fine pattern milled into the face. Look closely at the milling in the face of this wedge. Click for more images. 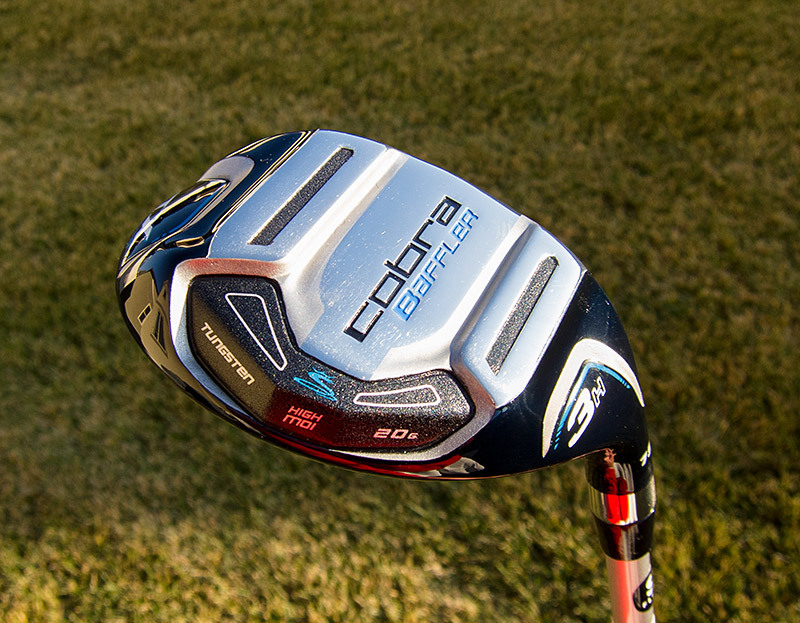 This pattern gives the club face an extra porous property which helps with control and great spin in the short game. I’ve had the SCOR wedges in play now for a couple of months. There was certainly an adjustment period for me, as the lofts were different and the shapes of the club heads were slightly different than what I was used to looking at. As an example, my old gap wedge was a 52 but my SCOR set includes a 54 and a 50. For quite a while I had to go through some calculations in my brain to determine the proper club for certain distances. A couple of times I pulled the wrong loft, thinking I was hitting a pitching wedge equivalent, but instead had pulled the 9-iron. Once I got used to the distances and comfortable with the looks and feel of the SCOR set, I got really dialed in. The gapping is great. I used to have a 10 yard gap between my lob and my sand wedge, as well as my 9-iron and pitching wedge. But there was a 15 yard gap between my sand and gap wedge and a 15 yard gap between my gap and pitching wedge. Now I have even yardage gaps from my 8-iron through the lob wedge. A nice inclusion with the set are the covers. I’ve never been one for iron covers, but these are so nice and sharp looking I like keeping them in pristine condition. Individual wedges from SCOR run $149 per club. 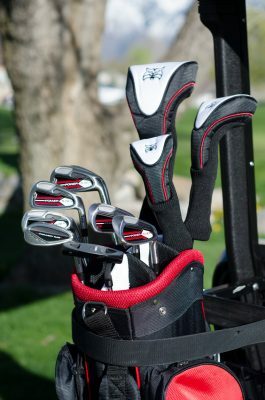 Matched sets in four or five clubs run $135 per club. The SCOR 4161 scoring club set is versatile, capable of producing great shots from any type of lie because of the V-Sole technology. The progressive weighting and perfectly gapped lofts make dialing in exact yardages as easy as ever. With a set of SCOR clubs, the only limits to one’s short game are within the player’s ability and imagination, not the clubs. I’ve met a lot of neat friends through my site, The Golf Space. One is the owner, founder, creator, brains behind Weszty Golf. My pal John Wesztergom founded Weszty Golf back in 2005 and has been passionately designing and building clubs since. Weszty’s mission is to make the game more enjoyable for players of all skill levels. Today we’ll be talking about highly skilled players. The Zt-C (I’ll call them the Zt’s from this point on) is an “Enhanced Blade” iron. For those who don’t know what a “blade” is, they’re typically smaller and harder to hit but allow more control of shot shapes and launch angles. Blades also have more “feedback” or feel of shots, translated to the player through the vibration and sound of the club. Higher level players, especially PGA Tour pros, often use blades. 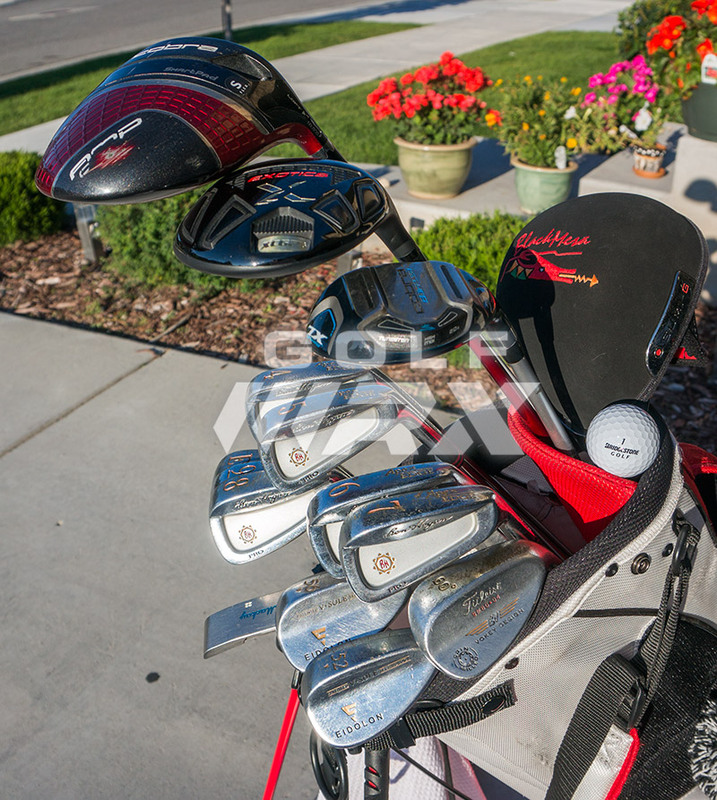 These clubs are definitely not for a 20 handicap player.